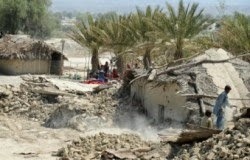 The death toll from an earthquake in southwestern Pakistan has reached 515, a provincial official said Friday, as insurgent attacks threaten relief efforts and survivors complain of lack of shelter from the scorching sun. A 6.8 magnitude aftershock jolted the same region on Saturday, bringing down more buildings amid ongoing search and rescue efforts. Local officials said by telephone it was likely the second quake had caused more deaths. Bodies are still being discovered in houses whose mud walls and wooden roof beams had collapsed.